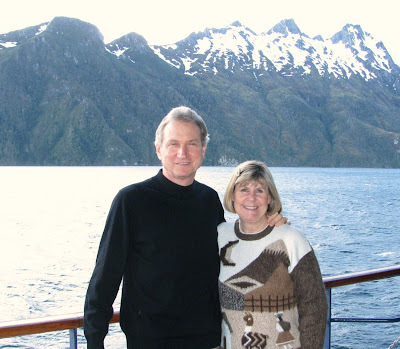 Our New Year began with a trip to a new continent, South America, aboard the Celebrity cruiseship, Infinity. Our itinerary below sets the stage for the adventures to follow. Dec. 19 - 20 - Flew to Santiago, Chile (by way of a brief stop sitting on the airplane in Lima, Peru) where we were met by the Celebrity crew, and after quite a wait in the airport,bused to the port of Valparaiso, and welcomed onboard our ship. As we were whisked out of Santiago very quickly, I had no opportunity to form any impressions of that city, other than to note the modern freeway and the landscape between Santiago and Valparaiso, which reminded us very much of the coastal landscape of southern California. Valparaiso itself was pretty much what I expected from South American cities...a few grand old buildings with impressive facades but which were covered with grime, and many more unimpressive modern buildings which were obviously made of inexpensive materials. With a few exceptions, this was our impression of most of the cities and towns we experienced. Dec. 21 - At sea, making our way south along the coast of Chile and enjoying a wonderful massage and facial in the Infinity Spa. Dec. 22 - Puerto Montt, Chile - a long day of travel into the countryside - and white water rafting on the Petruhoe River at the foot of two huge volcanoes. Dec. 23 - Chilean fjords - a grey, cloudy day cruising along the coast of Chile. Dec. 24 - The Strait of Magellan - a stormy morning in the southern Pacific and a peaceful Christmas Eve in the calm waters of the Strait of Magellan. Dec. 25 - Punta Arenas, Chile - Christmas Day with the penguins on the Patagonian plains! 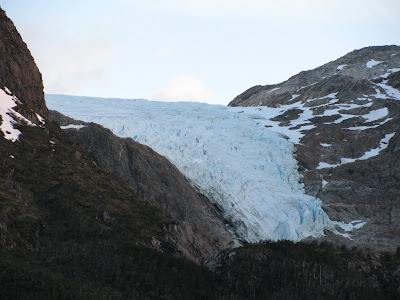 Dec. 26 - Ushuaia, Argentina - a chilly visit to the southernmost city in the world - and a visit to Tierra del Fuego National Park and the southern termination of the Pan American highway. Dec. 27 - Shivering in the early morning circumnavigation of Cape Horn and moving from the Pacific into the Atlantic Ocean. 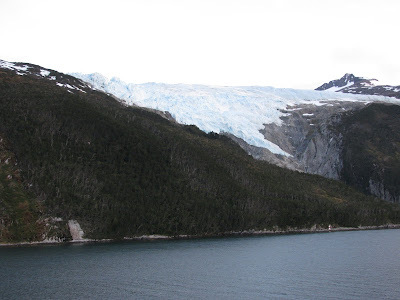 Dec. 28 - At sea, and heading north along the Patagonian coast of Argentina - and indulging in a second massage! Dec. 29 - Puerto Madryn, Argentina, with a lovely visit to the countryside, a great little paleontological museum, Welsh villages, and a float down the Chubut River. Dec. 30 - At sea, continuing north toward warmer weather. Dec. 31 - Montevideo, Uruguay - New Year's Eve mayhem in the streets! Jan. 2 - Buenos Aires, Argentina and a return to hot summer weather. Jan. 3 - The airport in Buenos Aires...ALL day! Jan. 4 - Home again - and falling into bed after being awake for 41 hours of traveling! Life on a Cruise ShipOur Days "At Sea"
Our stateroom was very nice, if a bit small. I'm always amazed at how much storage space they can pack into every corner of the room. It made it very easy to stay organized and neat. The veranda and the mirrored wall make the room seem bigger, although the chilly weather on this cruise kept us indoors most of the time. As always on our Celebrity cruises, our room steward was wonderful - courteous and friendly, and always prompt with any request. This was a very multicultural cruise. Every announcement over the loudspeaker was read in at least five different languages, and all of announcements for shore cruises and the evening performances were done in English and Spanish. It was fun to meet people from all over the world. (My trivia partners were a nice couple from France.) We met people from Greece, England, Germany, and I know there were Italians, Norwegians, Dutch, and of course, many people from Latin America on board. Our favorite passengers were a group of little old white haired ladies from New Zealand who sat in the Rendez Vous Lounge every evening before dinner. We especially fell in love with "Granny," who got up and danced enthusiastically to the rock band who played oldies every night. Toward the end of the cruise, we told their group leader how much we had enjoyed watching them, and when Granny heard about this, she insisted on coming over to meet us, announcing proudly that she was 86 years old. Such a sweety! There were a few little clashes due to some cultural differences. Rob and I were still on California time for a few days, so we were ready to fall into bed quite early, but most of the Latin American passengers had the late dinner seating and walked the halls late at night talking and laughing. Also, as it was a Christmas cruise, there were many families...400 children on board!...and we were awakened every night the first week by many of those children running and yelling in the halls. We heard a number of complaints from various passengers and finally an announcement was put into our "Celebrity Today" daily bulletin for parents to supervise their children. It seemed to help...the second week was much better. The nightly entertainment was excellent (with one notable exception). The singers and dancers were really talented and put on three major shows...a Broadway review (the best of the three), an 80's-themed show, and a New Year's Eve "Celebrate the World" spectacular...as well as a Christmas Eve performance and Christmas carols on the Grand Staircase. Several of them offered a backstage tour one day with a close-up look at some of the tricks to their 7-second costume changes and scenery storage right up in the bow of the ship. some of the feathered costumes for the "Celebrate the World" show were extremely heavy. They also talked about the difficulties of keeping their balance on a rolling ship and how they had a Plan B of less strenuous dance moves for the especially rocky nights. There was also live music all over the ship, including a Jazz Trio, a classical string quartet, the Dockers, an a capella choir, and the Party Band who performed on most days out by the pool. Milos Radakovich - who used to live in Pacific Grove! - was also a very entertaining speaker. He was a bit like Bill Bryson...full of interesting information, but light-hearted and fun to hear. He gave a number of talks on everything from sea life to the night sky. The most interesting for me was his excellent presentation on continental drift and the volcanoes that ring the Pacific Ocean. Rob and I both attended a seminar on digital photography, and I went to one of the computer seminars (which turned out to have a few short cut tips I could use, but was mostly aimed at brand-new computer users). There were also dozens of activities we didn't participate in...bingo tournaments, arts and crafts, language classes. The list went on and on. I did manage to fit in a couple of trips to the ship's casino...where I put in a $20, hit a little jackpot, and walked away with over $100! Hurray! We were onboard the Infinity for both Christmas and New Year's, so naturally the formal nights coincided with these special dates - plus one more on our first night at sea. I know it's not everybody's cup of tea, but I actually enjoy the chance to get all dolled up once in awhile, and it was fun to walk around the ship and see everyone looking so glamorous. Of course, the ship was also decked out with festive decorations, poinsettias, and Christmas trees. Christmas Eve was especially nice. After the cute little Christmas performance, with participation by some of the children in the ship's day-camp program, the Celebrity cast led us in singing Christmas carols out in the main lobby. This was always a tradition in my household growing up, so it felt quite nostalgic. New Year's Eve was lively...and quite wonderful. Rob and I went looking for the best party. We decided against the disco up in the Costellation Room which was jam packed with teens and noise, and the party outside on the deck was a bit too cold...so we found ourselves happily in the Rendez Vous lounge with the oldies band, dancing the night away. My midnight New Year's kiss from Rob was really quite romantic...a great way to start 2010! And, of course, the Food! Our waiter, Sunarta, from Bali, was a delight! He had quite a thick accent, and Rob and he had a running joke every night about his rrrrolling rrrrr's. The staff was very attentive and always remembered our special requests like ice tea every night. And Rob did his usual sneaky request for TWO lobsters on lobster night. So, all in all, we were pampered and spoiled to our heart's delight...but the best of the trip was still on land. The second stop was in Vincente Perez Rosales National Park, where we walked through the forest to the Laguna Verde. Because of the late start, we were getting very hungry, and I asked for a loan from a nice American family on the bus with us in order to buy a snack at the little food stand. Instead, their college age son gave us a meat empanada he had bought in the first town. We were so grateful! It made a big difference in our enjoyment of the day. Finally we arrived at the Petrohue River at the base of the snow-capped Orsono Volcano where we prepared for our adventure. The staff outfitted us with neoprene wetsuits, booties, life vests, jackets, and helmets. But they did NOT provide rooms for changing. The women ducked into one little tent set up on a dirt floor, while the men just made do with nature's setting. Then our regular clothes were piled into a van, and we headed for the rafts for an extensive safety talk. Well, I wasn't nervous before the talk...but by the time the leader was finished, I was wondering if we had made a big mistake! We learned how to hold on to the rope if we fell out...how to catch the lifeline if we fell out...how to float feet first with the current if we fell out...how to avoid getting our feet caught in the rocks and branches if we fell out. It began to feel that falling out was inevitable! Then it was another half hour of instruction from Carlos, our raft guide on how to paddle...paddle left, paddle right, stay together, left back, right back, forward forward forward! So we shoved off from the shore with beating hearts and found ourselves immediately in the roaring currrent, with huge waves breaking above our heads (the rapids are considered Level 3 to 4). I had worried most about being cold, but that was the least concern as we quickly worked up a lather paddling HARD to keep the raft straight. In between the rapids, there were some periods of calm floating that gave us a chance to catch our breath and look around at the gorgeous scenery...lush green grasses and trees along the river which ran right at the base of the volcano. I regretted not being able to take photos, but there would have been no way to keep a camera dry...or to hold onto one, as we spent most of the time paddling hard. We had a good team...the other couple on our raft was from England...and we all followed directions well and kept the raft fairly straight...and best of all, managed not to fall it. One raft, which carried the nice family who had provided us with the empanada, hit a big wave sideways and flipped right over, throwing the entire family into the river. They were fine...just very wet. We were greeted at the end of our trip with a snack of sandwiches and a little house in which we could change, the the bus drove us back to Puerto Montt. Our advertised 4-1/2 hour excursion had lasted about 8 hours, and we were the very last group to join the long line waiting for the tenders to take us back to the Infinity - but it was well worth it. A fun day! These two days were spent entirely at sea, pursuing some of the ship's activities described above. 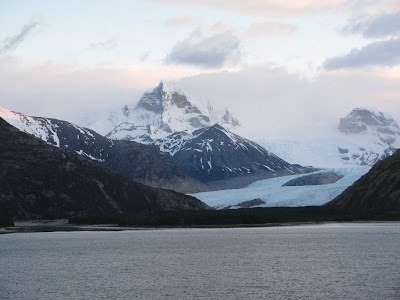 The weather was quite overcast, so some of our views of the Chilean coastline were a bit disappointing, although the evening of December 23 cleared nicely and we had some lovely views of the fjords. 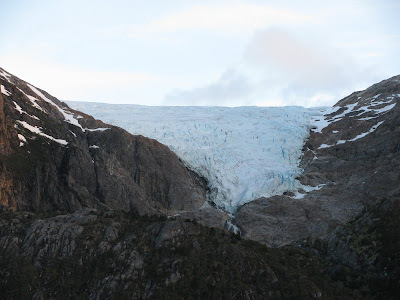 They are not as spectacular as those in Norway, but there are literally hundreds of them, carved into the land by the glaciers that covered this land in southern ice ages. We were far south by now and the days were noticeably longer. The last photos below were taken at around 10:30 p.m. The morning of Christmas Eve was quite an adventure. Of course, Santa arrived in the morning to greet the children. and later in the day, I came across this scene in the ship's library. Happily, the worst of the storm was fairly short-lived and when we actually entered the Strait of Magellan and were separated from the open ocean in the afternoon, the waters became very calm again, and although the skies were still dark and gloomy, we enjoyed a peaceful Christmas Eve enjoying the Christmas show and carols in the main foyer. We woke on Christmas Day to gorgeous sunshine. 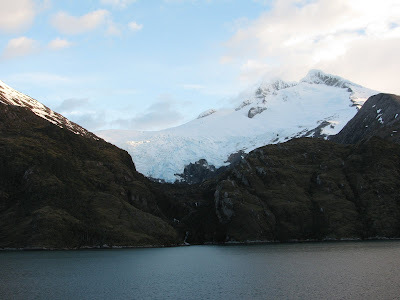 For our second shore adventure, we were once again tendered to the dock where we boarded our bus to Otway Sound, 75 miles to the west of the city of Punta Arenas. The countryside was green and pretty. It is a fairly harsh enviroment, and the trees were low and bent with the constant winds, but the wildflowers were in bloom and the fields were covered with lush grasses. The guide was a handsome young Chilean who gave us a running commentary on the history and geography of the region. We soon arrived at Otway Sound and began our walk along the boardwalk to the penguin colony. The penguins here burrow in the sand, so the boardwalk prevents the tourists from trampling on their nests. It was really enchanting to see these adorable birds in their natural enviroment. They were generally quite unconcerned about the people and went about their penguin business, preening on the edges of their burrows, or waddling down in little lines to the big group on the beach. This colony is not as large as some of those on other excursions on the trip. The population was variously described as anywhere from 3,000 to 10,000 penguins here. We certainly didn't see all of them, but they were scattered around the fields everywhere we looked. I'm not sure what it is that is so appealing about these little creatures, but their appeal is undeniable and it was a delightful morning...and a wonderful way to spend Christmas! At the end of our excursion, I strolled around the little port town to see their famous statue of Ferdinand Magellan and the statue of (now, here's a memorable name!) Bernardo O'Higgins, the first president of Chile, and to shop at the little market in the town square. The weather on this trip was much chillier than I had expected, but that just gave me a good excuse to buy a nice alpaca sweater, scarf, and hat! 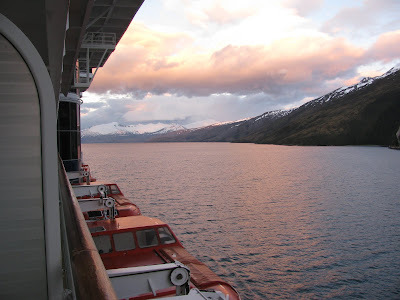 That evening we cruised further along the Strait of Magellan, enjoying the gorgeous scenery. 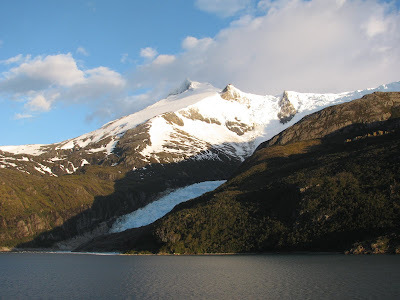 I set the alarm for 5 a.m., when our ship was due to enter the Beagle Channel, running south from the Strait of Magellan and heading toward the very southern tip of South America. 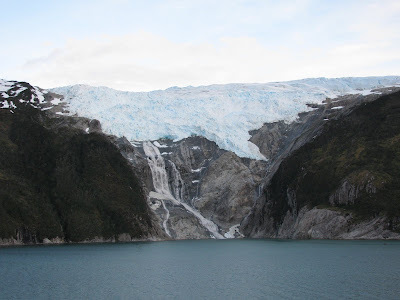 The Beagle Channel is lined with a series of glaciers and it was worth the early wake-up call to see them appearing one after another. I was especially glad I had made the effort, as many of them have receded greatly from the shore, and I suspect that several of them will have disappeared entirely within the next decade. 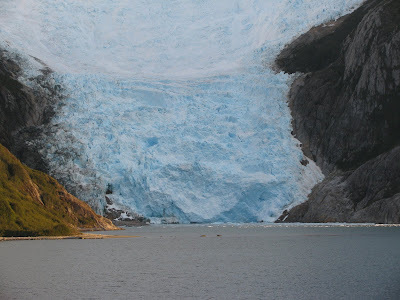 Rose at 5 a.m. to see the glaciers of the Beagle Channel. 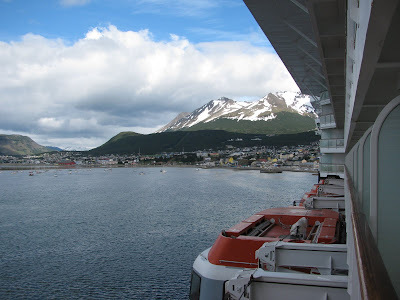 After breakfast, we got off the ship in the town of Ushuaia, which is the southernmost town in the world. There we joined up with another couple, Allan and Phyllis, to rent the services of a nice local woman, Claudia, to drive us the 10 kilometers to Tierra del Fuego National Park and the "Train to the End of the World." It worked out beautifully...she dropped us off at the train station and then picked us up at the end of the track and gave us a driving tour around the park. Her English was quite limited, and none of us spoke more than a few words of Spanish, but our Spanglish attempts to communicate were fun and good-natured, and Claudia and Rob had quite a lively conversation on the trip back to town. 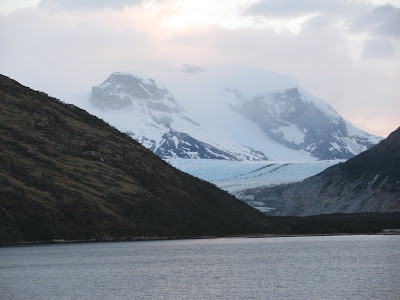 Tierra del Fuego was gorgeous...and not at all what I had expected. I had always envisioned it as a barren and wind-swept promontory sticking out into a churning ocean. Instead, it was a lush and wooded island filled with lakes, snow-capped peaks, woods, and thick orange peat bogs. This area was first established by Argentina as a penal colony and the train that took us through the park had originally been built to carry the prisoners into the woods to harvest the trees. There are still fields filled with the stumps of the cut trees...the height of the stump showing the level of the snow when the tree was cut down. We also saw replicas of the homes of the Yamana people who had populated this area for 10,000 years. We continued through the park with our driver, stopping for photos at several gorgeous bays and lakes The weather was chilly but usually clear and sunny, although we actually had a hail storm as we got off the train! Claudia explained that the weather there is always very changable. At one point on our tour we stopped for a traditional Argentinean sausage at one of the nice campgrounds. We ended with a special photo at the very southern tip of the Pan American Highway. It was fun to realize where we were...at the very tip of the continent, with nothing but 750 miles of ocean between us and Antarctica! In the afternoon, I explored the little town for awhile. 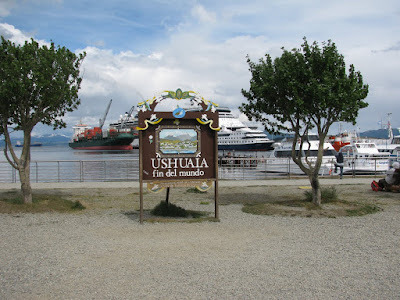 In spite of its remote location, Ushuaia was actually one of the nicest towns we visited. It is a tourist desination, with summer camping, fishing, and hiking and winter skiing, so the buildings were a bit more modern and well-maintained than those in some of the other stops. I stopped in brightly colored little handicraft marketplace on my way back to the ship and bought a couple of pretty handmade necklaces of lapis lazuli and rhodochrosite (called locally Incan rose) for practically nothing, then joined Rob back onboard as we "set sail" on our way to the very tip of the continent...Cape Horn. The Captain of the Infinity seemed to be something of a sadist...Once again, I was up at the crack of dawn (which comes VERY early in these far southern latitudes!) 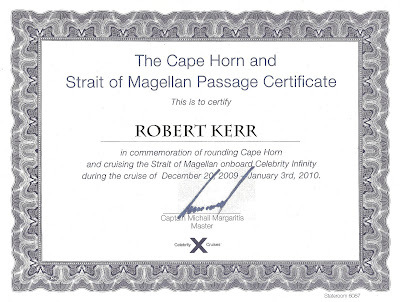 - this time to watch our circumnavigation of Cape Horn. By 6 a.m., the Constellation Lounge was already filling with passengers grabbing their coffee and croissants and watching from the comfort of the seats in the very bow of the ship. I bundled up and went out on the windy deck to listen to the narration over the loudspeakers and to snap photos of the journey. The Cape itself is not particularly noteworthy. There is a lighthouse and an abstract sculpture of an albatross. But the romance of the location is fun, and I gave some special thought to the hardy adventurers who had rounded this rocky point on their way to the gold fields of California. Soon we were rounding the Cape and moving from the Pacific into the Atlantic Ocean, beginning our journey north to warmer climes. Looking south, there was now absolutely nothing between us and Antarctica...and you could feel the Antarctic chill in the air! 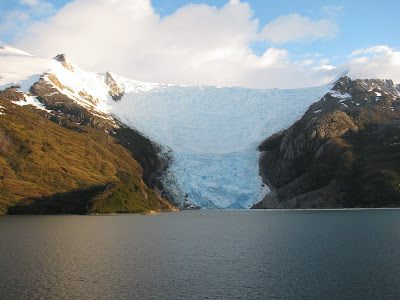 The rest of the day and the next, December 28, were spent at sea, enjoying the activities on board - and our second massage of the cruise - as we sailed along the Patagonian plains of Argentina. The weather warmed considerably as we traveled north, and one of the ship's activities that day was the "Penguin Plunge"...the participants had to waddle like a penguin, dive into the cold pool, and swim to the other end. Very cute! The city of Puerto Madryn, lying about half way up the Argentinean coast, has a very interesting history. In the mid-1800's, Argentina laid claim to huge tracts of land in Patagonia, but had no one to settle it. At the same time, the Welsh people were angry that the English were destroying their cherished language and culture. Argentina promised the Welsh settlers land and cultural independence in exchange for a promise of loyalty. In 1865, a group of Welsh immigrants landed here in Puerto Madryn and soon had founded a string of towns: Donlaven, Gaiman, and Trelew, running from the port to Rio Chubut, about 60 miles inland. It must have been a shock to the settlers. This area is a desert, and water continues to be a problem. Fresh water is still carried in pipes from the river to the port. to our first stop, the excellent paleontological museum in the town of Trelew. After touring the museum, with its impressive collection of replicas of the dinosaurs which once roamed this area, Rob made friends with a scrawny little dog that was resting in the shade of a big bush. The poor little thing was starving and very timid. She was very wary of approaching us at first, but after talking to her gently and scratching her behind the ears, she became a loyal little companion and followed us around the grounds for the rest of the stop. It broke our hearts that we couldn't take her home and get her fattened up! We drove a bit further to the town of Donlaven, where we found our river rafts waiting for us on the banks of the Chubut River. This was a very different rafting experience from the first one...a leisurely float down the pretty river listening to the birds and watching the little brown and white falcons zooming overhead. We were floating through the farmlands of an Argetinean descendant of Italian immigrants, and he and his family greeted us at the end of the trip with a snack of homemade cheeses, sausages, and wine. The young son played the guitar and sang for us excellently well. Just as we boarded the buses, the wind came up and the skies clouded over. We made one more stop in the town of Gaiman to tour the old railroad station and the first house built in the town. The old woman who greeted us in the little railroad museum looked like she had stepped out a Welsh village, and she and her grandson, Fabio, still spoke the old language of their ancestors together. The towns themselves, in spite of the presence of traditional tea rooms, did NOT look Welsh. They looked like the other rather shabby and poor towns we had seen during this trip, with homes of adobe, cement blocks, and wood. It is obvious that South America still has economic obstacles when compared with the United States and Europe, but the people were warm and welcoming. December 30 was our last "at sea" day, as we continued north into much warmer and sunnier weather. Funnily enough, as the days got warmer, they also became noticeably shorter as we headed away from the far southern latitudes. We started the day with a special brunch that displayed an overwhelming display of goodies. I spent the day running around to several fun activities, including the usual trivia contest, a "Name That Tune" game on the deck, and a Movie Scene-It game (which my partners and I won hands down). New Year's Eve found us docking in Montevideo, Uruguay where we used the walking tour map provided by the ship to explore the city on our own. There was a clearly marked walking path leading us into the heart of the city, and the "Tourist Police" in their yellow vests were very much in evidence. There were also a number of traffic controllers who helped us cross the streets. Apparently, the drivers here don't stop for pedestrians until you just step out in the street and force them to stop! 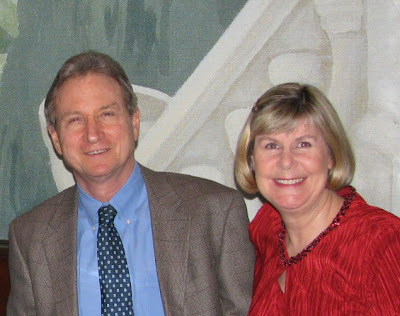 We ran into Phyllis and Allan again and joined them for a stroll down the main pedestrian street, very much like the pedestrian streets we enjoy so much in Europe, except that everything just seems shabbier...the beautiful old facades are corroded or broken, the streets are uneven. You can see the old glory of the turn of the century but the government did not seem able to maintain it into the present. We stopped along the way several times to peruse the various outdoor markets, which were an odd little mix of touristy arts and crafts and pure junk...old rusty chains, silverware, lots of religious artifacts. We also had a fun surprise as we crossed one of the tree filled plazas...a flock of cute little peach-faced conures nesting in the branches above us! Near the same square was a cathedral that was all decked out for Christmas...cattycorner to the Montevideo McDonalds! Rob was on his usual quest to find a good barbershop and got an excellent haircut. He is always pleased with the results of his overseas haircuts...the barbers and hairdressers take such pride in their work and really take care over getting the cut just right. when we suddenly noticed a very singular event...out of the windows of many of the high rise office buildings came floating thousands of pieces of white paper...the leaves from hundreds of calendars being thrown out in celebration of the New Year! We started back toward the ship for lunch when we were introduced to another Montevideo New Year tradition, people on the balconies overhead throwing water from buckets, waterballoons, and squirt guns on the passers by below. We tried to find a route that was "safe," but it was happening everywhere, so Rob made the locals laugh by pulling out his umbrella and walking happily back, past the crowds of locals chanting, drumming, and dancing in the streets. Several times as I was snapping photos, local boys called out, "Take my picture!" and laughingly posed for me. The streets were beginning to be filled with locals celebrating the holiday, and we began to hear the boom of cherry bombs reverberating against the buildings, so we decided it was time to retreat to the ship. We had lunch onboard, but from the deck we could see a big street party going on in a nearby square, so we headed back once more. A big mistake! The streets were now full of drunk and rowdy locals celebrating New Year's Eve. There were green plastic soda bottles lying everywhere in the streets, and the smell of beer was pungent in the air. I stopped to take a little video of the mayhem, when suddenly my camera was snatched from my hand...the wrist band snapping right off...by a young man running through the crowd. I yelled out and immediately, the young thug was tackled by another big fellow who held him in a headlock while I pulled the camera back. I thanked my savior fervently and ran to find Rob, ahead in the crowd. A young woman saw everything and advised us to go back to the ship, saying that it really wasn't safe for us. I know most of the chaos was good-natured, but we decided to take her advice. New Year's Eve on the ship was very memorable. 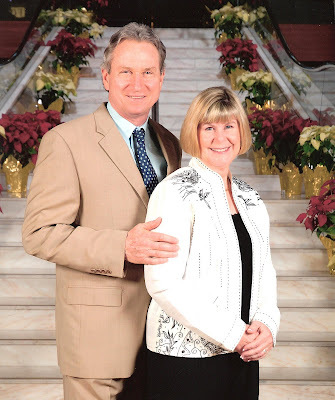 We had our last "formal" dinner, then explored the various parties going on all over the ship. We decided against the disco in the Constellation Club, where most of the teens were congregating, and selected our favorite oldies band in the Rendez Vous Lounge, where we danced the night away and shared a very romantic New Year's kiss on the stroke of midnight. We ended New Year's Eve with a scene right out of The Love Boat...standing on the deck in the trail of a full moon shining on the water! then over the "Wavy Bridge" and on to some of the other towns of the area. The group chose to go all the way to the furthest town in the area, which was probably a mistake, as we had to rush to get back to the ship in time to catch the last tender, which meant that the most interesting stop of the day - to see Casapueblo, a remarkable "house" and work of art by the artist, Carlos Paez Vilaro - had to be cut short. We had just time to get out of the van and snap a quick photo, which was a shame, as I would love to have explored the building and grounds. We stood in a very long and very hot line waiting for the tenders back to the ship, and then we were on our way to our very last stop. Our day in Punta del Este ended with the most amazing lightning storm I have ever seen. It was far in the distance, but the lightning flashed almost continuously We sat on ou.r little balcony enjoying nature's fireworks for almost an hour. Buenos Aires is a huge city of 12 million people. We were docked quite a way away from the city center, so the ship provided vans to take us to the "old port" where we could find transportation or tours around the city. Even more impressive were the pretty little black-faced conures chattering in the trees above us in the square. then continued across the square to the Metropolitan Cathedral. Then we walked down the road to the big Obelisk that stands in the middle of one of the wide boulevards that criss cross the city. We walked along Florida Street, a pedestrian street packed with shops and cafes, then down to Puerto Madero. a big canal lined with hotels and business buildings. The day was quite warm and by lunch time, we were tired and a bit "touristed out," so we found a taxi to take us back to the port and spent the afternoon packing and getting ready for our trip home. That evening was the final show...a tango show by the Pampas Devils, a group from the city who came on board to dazzle us with their traditional dance. The next morning, we departed the Infinity and spent literally the entire day waiting at the airport. We arrived around 10 a.m. and our flight didn't leave until 9:20 that evening. The day actually passed quite easily. We both had our books to read, and spent a couple of hours chatting with a nice family from South Africa. The first leg of our flight took us to Miami, where we went through customs and then flew on to Los Angeles. By the time we drove home to Bakersfield, we had been traveling for 41 hours! Max and Maggie were ecstatic to see us...and naturally, the first order of business was to go collect Lily and Scamper. It is exciting to explore the world...but it is always nice to be home! Click Below for Email Updates! © Joan Lindsay Kerr. Picture Window theme. Theme images by konradlew. Powered by Blogger.